Prosecutors recommended putting former MK Binyamin Ben-Eliezer on trial for of bribery, Channel Two reported. State prosecutors recommended Thursday putting former MK Binyamin Ben-Eliezer on trial for several charges of bribery, Channel Two reported. The Prosecution's recommendation comes a month after police also recommended bringing the former MK to trial. Ben-Eliezer is suspected of receiving large sums of money when he was Minister of Infrastructure in 2006. The money was given to him to get to approve projects for large businesses that “donated” money to him. He is also accused of money laundering, allegedly hiding millions of shekels in relatives’ bank accounts. Ben-Eliezer was previously involved in another controversy, when an investigative television report revealed that he had frequented “exclusive and discreet” casinos in London when he was serving as a top government minister in the administration of Ehud Barak a decade ago. The case was never brought to trial. 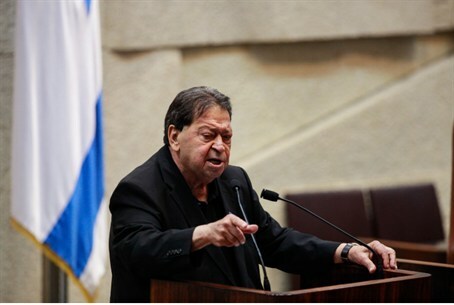 Citing health problems, Ben-Eliezer announced that he was resigning from the Knesset. In his resignation letter to Knesset Speaker Yuli Edelstein, Ben-Eliezer wrrrr that “after a long decision making process and a difficult struggle with my thoughts on the matter, I have decided to resign from my Knesset post. As you know, I have been suffering from health problems in recent years,” he wrote, adding that he was a candidate for a kidney transplant. Ben-Eliezer, 78, is a former top IDF commander and has been active in Israeli political life since 1984. In 1992, he was appointed Minister of Housing and Construction in Yitzhak Rabin's government, and was Deputy Prime Minister and Minister of Communications in Ehud Barak's government in 1999.